Right that’s it. I am decided. I will never travel to Venice. Only bad things happen there. As for evidence, I present you with Death in Venice; Don’t Look Now; the city’s a literary death trap! Plus I hear Venetians don’t like tourists and I look just like a tourist. Even when I am at home. So this book’s setting earns a black mark from me, but also its author. 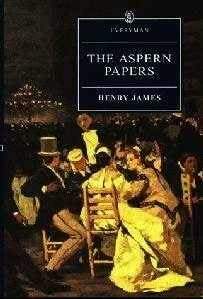 I have had a troubled history with Henry James. I tried to read The Portrait of a Lady when I was a teenager (I believe the Nicole Kidman film had just come out). I did not make it past the second chapter. The prose just killed me, it was far too dense. I have since managed to read The Turn of the Screw (an excellent book that has been adapted into an equally excellent film – The Innocents), but that was nice and short, not long enough for James’ prose style to hurt my fragile brain. This book is equally short and I am quite grateful for it. The Aspern Papers is concerned with the efforts of our nameless narrator, a poetry devotee, to worm his way into the affections of two ladies who may in possession of missing material belonging to the dead poet Jeffrey Aspern. Pretending to be an innocent lodger, the narrator moves into the home of Miss Juliana Bordereau, a former lover of Aspern. Attempting to feel out how she would respond to his request for information about his literary hero, he discovers that her reserve is unaffected by his obsequious entreaties. Instead he turns to her niece, Tina, who proves more amenable to his advances. A curious game of cat and mouse emerges, bound up in wordplay and the limits of politeness. As Miss Juliana’s health begins to fail, the narrator becomes more desperate to become the beneficiary of his literary hero’s legacy. How far is he willing to do. I have to say I actually found myself enjoying the prose of my nemesis with this book. James invests an incredible amount of psychological detail into his characters. The narrator’s treatment of Tina is quite cruel, but she is revealed to have hidden stores of strength, taking him by surprise before the story’s conclusion. Miss Juliana might be a Dickensian Miss Haversham (certainly in the narrator’s covetous eyes she is), were it not for the fact that she has lived a full life and now simply wants to be left to her memories. What right does this book thief have to plunder them? A civilized battle of wits, with a satirical bent. Surprisingly enjoyable for me. Argh! I still want to go to Venice and when I do I will just pray nothing bad happens there! Never could get into James either but maybe I’ll give this one a try sometime. Well my dad lived for years in Toronto, so I have always wanted to visit. I think James is one of those writers who is worth the investment, despite the initial difficulty.